Named for: J.S. White, farmer from KwaZulu-Natal who sent roots of the plant to Kew. 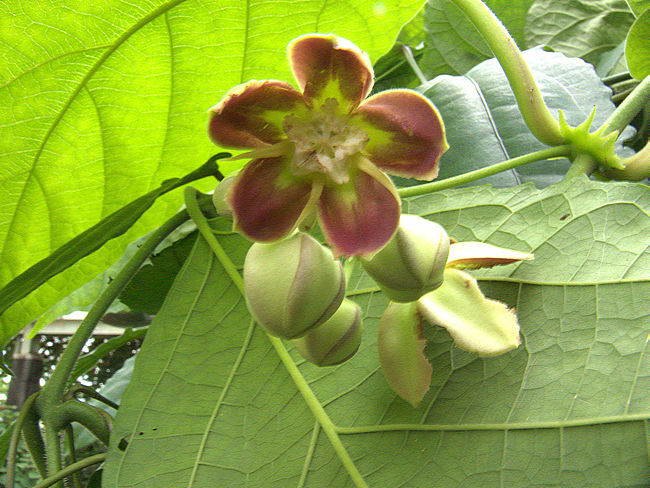 The genus Mondia is related to Periploca and includes two species of perennial climbing leafy vines from tropical Africa. is a vigorous woody, climbing vine with large veined heart-shaped leaves and a large white tuberous root, said to have an aroma of vanilla. Mondia whitei is widely distributed across tropical Africa, but has become rare through over-collection of the roots. It produces umbels of reddish flowers with greenish margins, and a perfume of sweaty socks. Although the flowers are short-lived, they are produced throughout the summer. Mondia whitei has been used as a traditional remedy for numerous ailments including male infertility, as an aphrodisiac, and to make a digestive beverage similar to ginger beer. Unfortunately, use of the root destroys the plant and it is extinct across some of its former range. 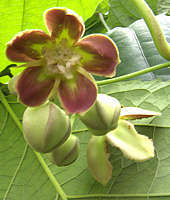 The seeds in the woody fruits are said to have been used to make arrow poison, so should be treated with caution. Suitable as a vigorous climber for a frost-free garden or conservatory.